To all those football fans and non-fans out there who, over the past 6 years, have emailed your MSP, attended surgeries, joined demonstrations, donated to the FAC Legal Defence Fund, took part in banner protests, dished out leaflets, sang songs of support or just showed solidarity to any fellow football fan caught up in this legal nightmare, please take a bow – it is not buried yet but it is in the hearse and on its way to the cemetery! The Repeal Bill has been lodged today and the process of scrutinising it will take place early in the next Parliamentary session. According to the sponsor of the Repeal Bill, James Kelly MSP, it is likely to be voted on before the end of this calendar year. At that point we won’t be taking bows, we will be dancing in the streets! 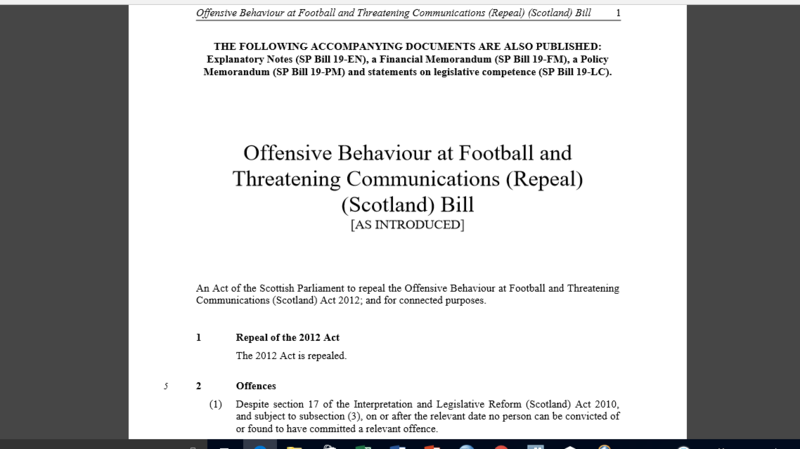 The Repeal Bill repeals the Offensive Behaviour at Football Act – obviously – but it’s provisions also mean that anyone who has an unconcluded case will have those charges dropped and nobody can be charged under the Act after the repeal date even if the alleged behaviour took place before it. Our task now, which we will be taking up from the start of the new football season (so watch out for that), is to make sure that any attempt to thwart the will of the people and the parliament by unnecessarily delaying the progress of the Repeal Bill will be vigorously challenged. The Government should be in no doubt, we intend to have the OB Act repealed and to do so as a matter of urgency. The best thing for them to do now is to acknowledge the mood of the people and the parliament and work with James Kelly to progress the Repeal Bill with no undue delay. This has been a long and difficult campaign but we are in the home strait – please continue to support the campaign and to keep up your vocal and visible opposition to the OB Act until it is dead and buried and the dirt is tramped down!